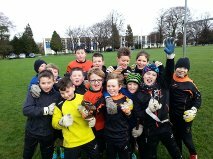 Just4Keepers v Just4Strikers, over Christmas J4K took on J4S in what will be an annual tournament, there were some outstanding saves and unfortunately some very good goals BUT with great pleasure I can tell you JUST4KEEPERS were the champions this year. Big John was the J4K Captain, you might see him in all the celebrations holding the trophy, GO J4K. 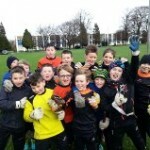 It goes to show what specific Goalkeeper Training and Goalkeeper Coaching can achieve for talented young Goalkeepers in Dublin, the standard of Goalkeeping was absolutely OUTSTANDING, it also shows that Striker Training is vitally important for young hopefuls, as the accuracy shown by the strikers was also of a top class.